ATV Parts, ATV Radiator Kits, ATV Wheels Tires, ATV Suspension Springs Shocks Bumpers - Wild Boar ATV Parts > Bumpers > Can-am Maverick 800/1000 All Years & Models Front Bumper w/Lights $330.00 FREE SHIPPING! 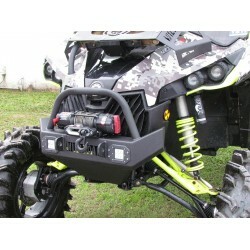 « Yamaha Grizzly 700 & Kodiak 700 14-Up Radiator Relocation Kit w/ Screen (Silver) $189.00 FREE SHIPPING! Now Only $330.00 Free Shipping! This Bumper includes everything you need for install! Audio Systems,Wild Boar Maverick Radiator Kit, Wild Boar Radiator Kit Red Screen, Wild Boar Radiator Kit Silver Screen, LED Lighting, Accessories, Cleaners & Oil Change Kits, BELTS, AXLES, Lift Kits, Snorkel Kits, WINCHES, Wheel Spacers, Tires & Wheels, BIG WHEEL KITS! To make this product even better, it comes winch ready with pre-drilled holes to match most major winch brands including KFI, Warn, Badlands and more! This product relocates your winch to the top of the bumper for better access to your winch when you’re in deep, sticky mud. The Wild Boar Heavy Duty Maverick Front Bumper was made tough enough for you to use up to a 5000lb winch.